Compared to the natural charms of Mateus Bailon’s native Brazil, The White Hart pub in gritty Whitechapel must seem quite far removed! Best known for it’s links to Jack the Ripper and oozing with the history of the East End, today the pub is the setting for an interview with an artist who has steadily been making his mark on the streets of London. 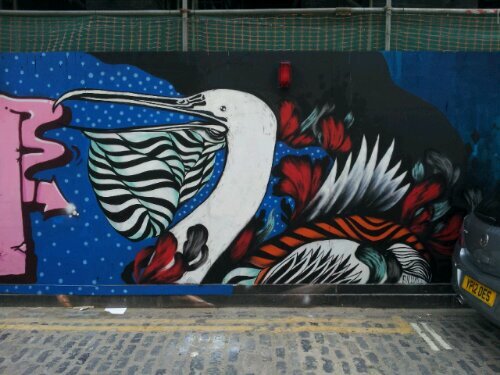 Mateus Bailon is a street artist from a small town in the south of Brazil called Itajai. The nearest major city is Sao Paulo some 8 hours drive north. 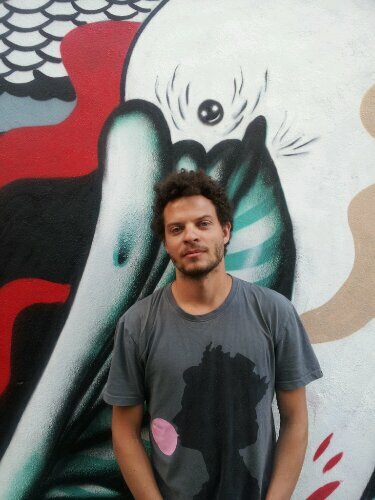 He is one of a wave of artists from the country moving further afield to establish Brazilian street art as one of the most vibrant scenes anywhere in the world. 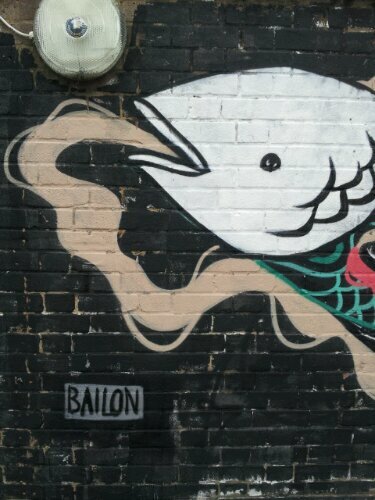 For Bailon it’s something he is proud to be part of. “Brazil has a strong scene, especially in Sao Paulo” he explains. “it’s growing and growing and it’s good to see friends and people from the country spreading Brazilian art all over the world, it’s good to be part of this”. The interplay between nature, the life of the city and what it is to be human is clearly important to Mateus. He explains how those drivers meet in his work, “A fish can’t live outside the water and the birds are easily caught by human beings or other animals. So it started like this but now it’s also a case of wanting to bring nature into the city.” For the observer it brings a new dimension to the work! The representation of the animal world on the streets of the East End realises the prison metaphor. Nature, trapped on the wall, yet appearing free within the confines of the concrete jungle! Largely self-taught as an artist Mateus started young, “since I was little I was always drawing and painting” he says. Now he has painted all over the world and after a few more weeks in London he’ll head to Paris and then, in September, to Barcelona for his first solo show at the Fousion Gallery. He’s come a long way! 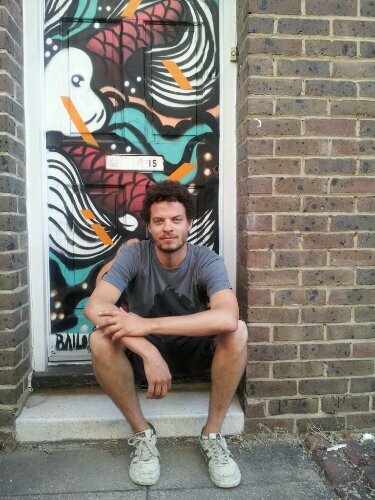 His work can be seen all over East London with spots in the obvious hubs of Shoreditch and Dalston. 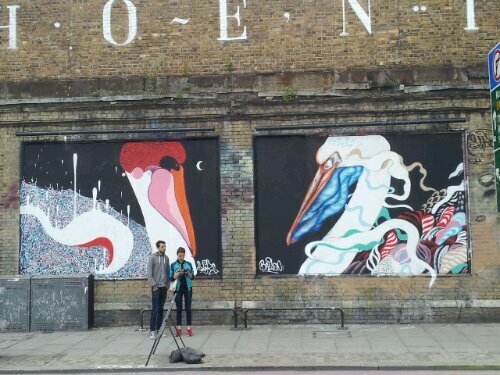 He’s contributed a large mural as part of Global Street Art’s Sydenham street art festival; painted a barge near Tower Bridge with ‘Propa Stuff’ and collaborated with the likes of Miss Van and Zadok. For Mateus, working on so many projects and seeing other artists work and working with other people is all part of the learning process. “There are loads of other artists from all over the world painting here, it’s good to be able to see, meet and sometimes paint with them”. Just before we finish the interview I ask what his next project is. “I’m going to paint my friends shed” he replies. Mateus just wants to paint! Doors, walls, boats, sheds it doesn’t matter just so long as he can. Painting in different places and in different environments is important. “Inspirations come from everything. Everything around me, the people I know, the place I’m living at that particular moment. Everything somehow influences my work”. Even it would seem, his friends shed! 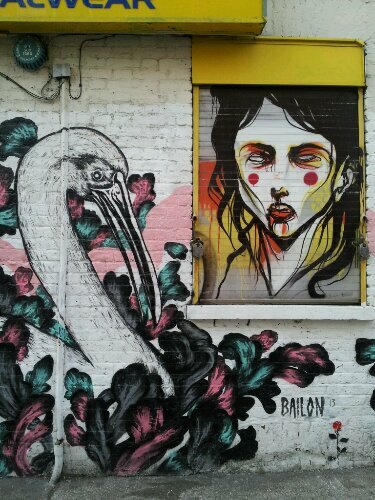 Bailon, all the sucess for you my friend! congratss! !